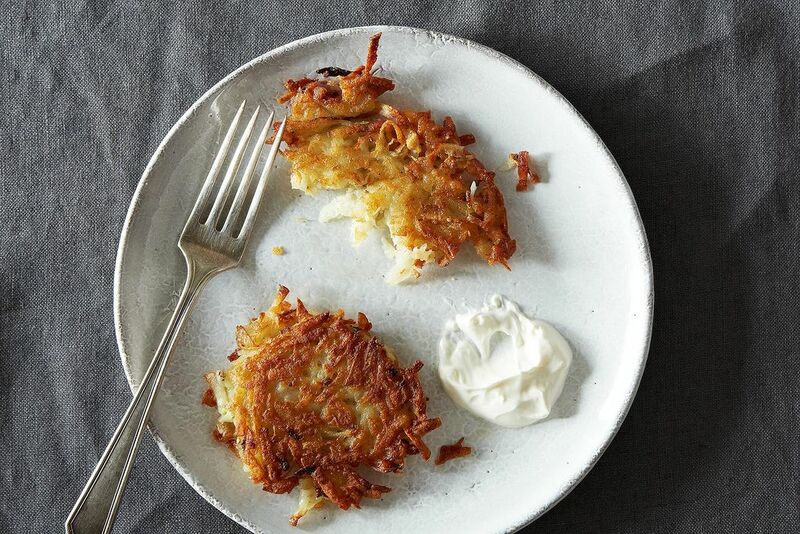 Today: Food52's Managing Editor Brette Warshaw shows us how to make perfect potato pancakes -- without a recipe. Thanksgiving has its turkey; Christmas has its roast. Fourth of July calls for pie, for crumble; Valentine's Day screams for chocolate mousse. These holidays, while fun and festive and (obviously) delicious, can be fussy. They can be stressful. They can be wonderfully -- or scarily -- high maintenance. Of course, you can fancy these up; you can use sweet potatoes or parsnips or even mashed potatoes. You can add spices and cheese. You can make a Thanksgivukkah double-down. And, most importantly, you can make these any time of the year: for those high-maintenance holidays, for weeknight dinners, for passed hors d'oeuvres, for snack. 1. 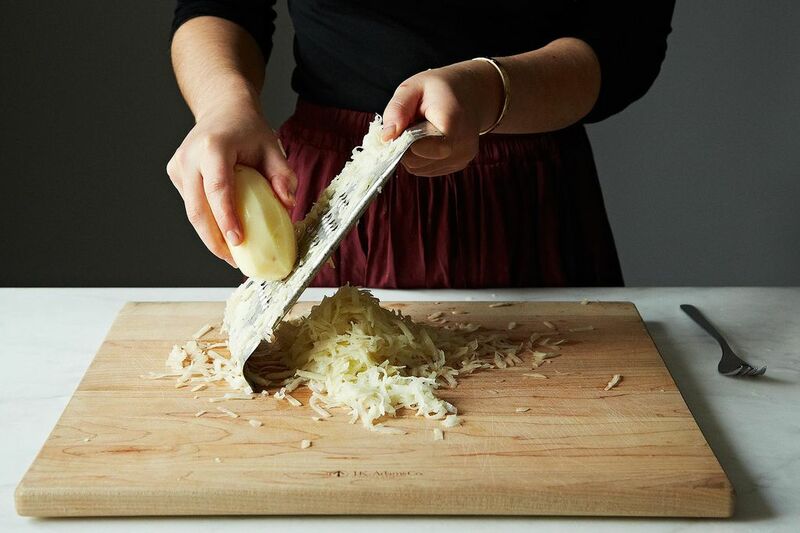 Coarsely grate your potatoes and onions by hand (or use the grater blade of a food processor). I use one onion for every two pounds of potatoes, but you can really go with your gut here. 2. Gather your shreds in cheese cloth or a tea towel and squeeze the water out. Let it all rest, and then squeeze again. You want to get as much water out as possible (you'll be shocked how much comes out!). 3. Lightly beat 1 egg in a bowl (I use roughly one egg for every two pounds of potato.). Add your shredded potato and onion, and mix well. I usually use 1 to 2 tablespoons of flour for every egg, but if you'd prefer these more cake-y and less shred-y, add up to 1/4 cup flour. Mix well, and season with salt and pepper. If you want to add spices, now's your moment! 4. Heat 1/8-inch oil in a a saute pan. Drop heaping spoonfuls of your batter into the oil, making sure not to crowd the pan. (Feel free to make these whatever size you'd like.) Fry until golden brown, then flip and finish cooking on the other side. Repeat until all of your batter is gone, keeping the finished ones in a 200°F oven so that they stay nice and warm. 5. Dollop with sour cream, applesauce, and/or caviar (it's a holiday!). Eat with a fork -- or your hands. 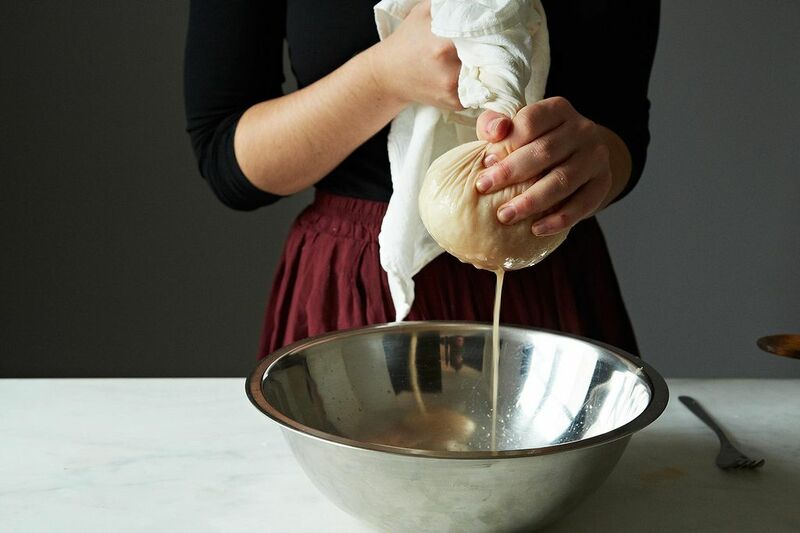 Get ready to make another batch. More: See how to make applesauce without a recipe. How do you make your latkes? Let us know in the comments! We're looking for contributors! Email [email protected] and tell us the dish you make in your sleep, without a recipe. I have never been able to keep them warm in the oven without them getting soft! I make them nice and crispy and then we usually eat them to order. Any tips? MATZO MEAL PEOPLE, MATZO MEAL. FLOUR IS NOT THE SAME. My potato pancake experience comes via my Polish grandmother. Back in '08 I was in Silicia (SW part of the country) and had a pancake cook-off with my friend and colleague who is a very good cook. We agreed to disagree on the finer points, but both enjoyed the tourney. Grate potatoes and onion separately. I greatly prefer a box grater, medium side for the potatoes, coarse side for the onion. Squeeze out potatoes firmly between your hands, reserving liquid in a bowl to let the starch settle for a few minutes. Combine potatoes, onion, egg, flour, pepper, and parsley in a bowl. Pour off potato liquid and add settled potato starch to bowl, and mix well. Put a tablespoon of oil on a hot griddle pan and fry pancakes (four to a 12 inch griddle using half the mixture each time) at medium high heat, smoothing and spreading the potato mix (you don't want too thick), till crisp at the edges and browned on the underside. Turn over and finish cooking, adding a little oil if needed, and put a little pat of butter atop each pancake when nearly finished, to melt. Repeat with rest of potatoes, adding more oil as needed. Serve with apple sauce (as my mother did) or sour cream on the side, if you like. Suzanne, what an incredibly sensible idea. I'm surprised I hadn't thought of it, since I use my salad spinner almost daily for salad greens. Sounds so much more efficient than ringing out towels. I will definitely use it nest time I make Latkes, which I hope is soon. Otherwise this recipe is perfect! Great recipe, great website! I've always placed grated potatoes in a salad spinner and spin out excess liquid 1-2 times; it works great and SO much easier!!! I do the same with zucchini and all other watery veggies, if possible and required in recipe. I've NEVER ever seen this idea mentioned anywhere! I've always done it! I add carrot and zucchini. Best latke recipe ever! Wringing the potatoes out twice was a great trick! We loved every bite. Any other toppings besides sour cream, apple sauce and caviar (yuck)? My father always topped the latkes with a sprinkle of sugar and that's the way I like them. My Grandma always served hers with a thin chocolate sauce. Spice in the latke was cinnamon. Potatoes and onions grated on box grater, not shredded. I use my fine grinder on my Kitchen Aid attachment. Sharon - on Pesach use same amount of Matzo Meal as you would use flour and it will be fine. I use Matzo Meal all the time because I like the taste it gives the latkes. Flour makes them too bland. I grate the potatoes in the food processor, put them in a strainer, chane to the steel knife and pulse the onions with the eggs and s&p, then put the egg mix in a large bow;, then I pulse half of the grated potatoes and then mix all the potatoes into the egg and onion mix. I cover the top of the mix with flour, creating a "cover". That was my father's trick to keep the potatoes from turning gray. This way I can prep the mix, and leave it until ready to fry. Then I mix the flour into the potato mix and fry. (If Pesach I do not use any thickener). I reheat, if necessary, in a 400 oven for 10 mins - delish! Approximately how many latkes will 2 lbs of potatoes make? How big are you making them? I got 11 out of 2 lbs. WOULDNT INCLUDE THE skins-- by peeling, you wont get all the pesticides out, but you will get some. better then none. How is this not a recipe? 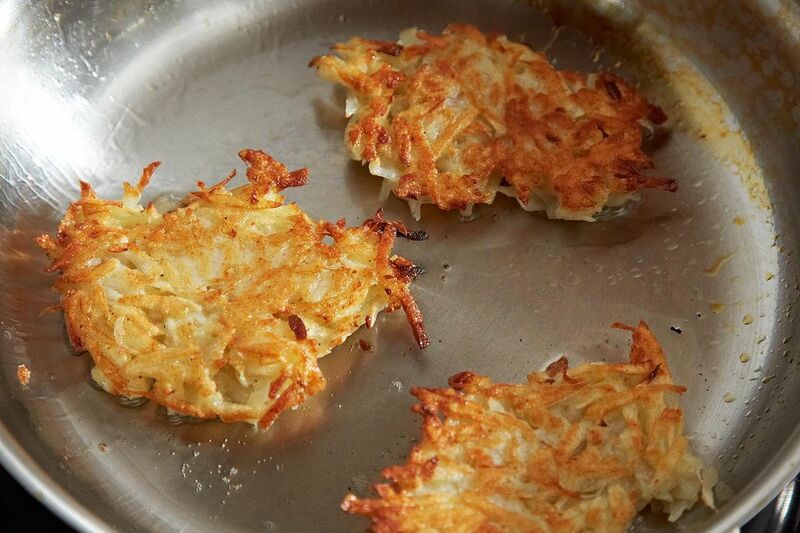 To me, latkes are best hot and straight from the pan. That being said, any suggestions for pre-cooking/re-heating? I'm having a party and don't want to stand over the fry pan all evening. I set my foods on a food warmer or teapot warmer. They are like the warmer used for fondue. They are found many places for sale. There are also electric food warmers and all of these are fine with pyrex or oven safe dishes or stainless platters. I suggest a warmer and cover the dish if possible to keep the food from drying out. Cool latkes on a rack. Wrap and store. Reheat on a rack set over a sheet pan,, single layer in a 350°F oven for about 15 - 20 minutes or until crisp. I usually add one shredded carrot for every 2 pounds of potatoes. 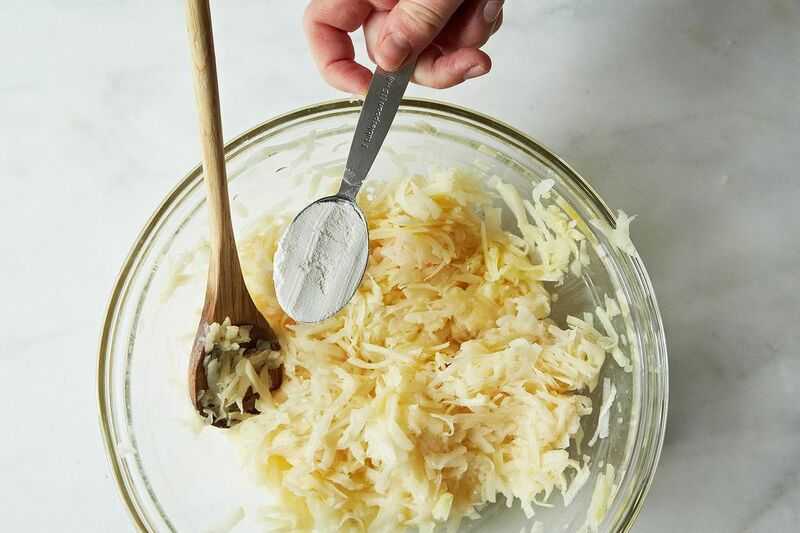 It adds a little sweetness to the latke. 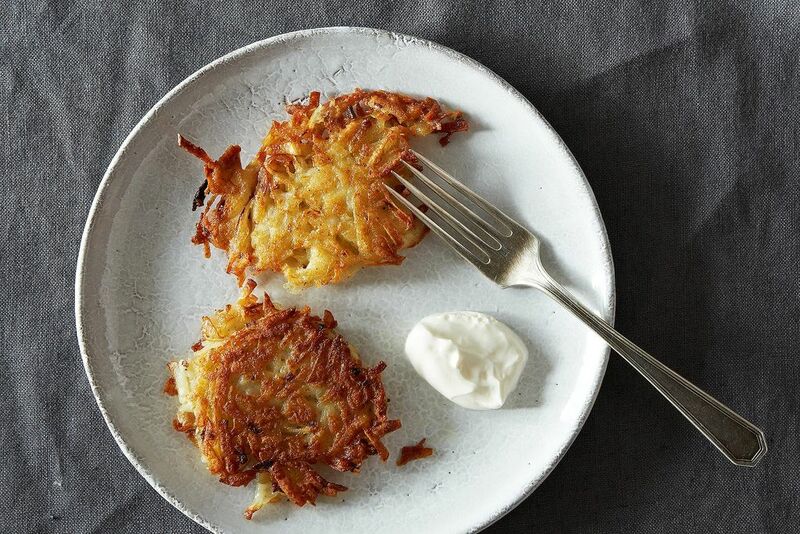 Can latkes be made without egg? I don't eat eggs but love the idea of latkes. More breaking news! You don't have to peel the potatoes. Use baking potatoes (which some of us still call Idaho...) Try it - I've done it for years.